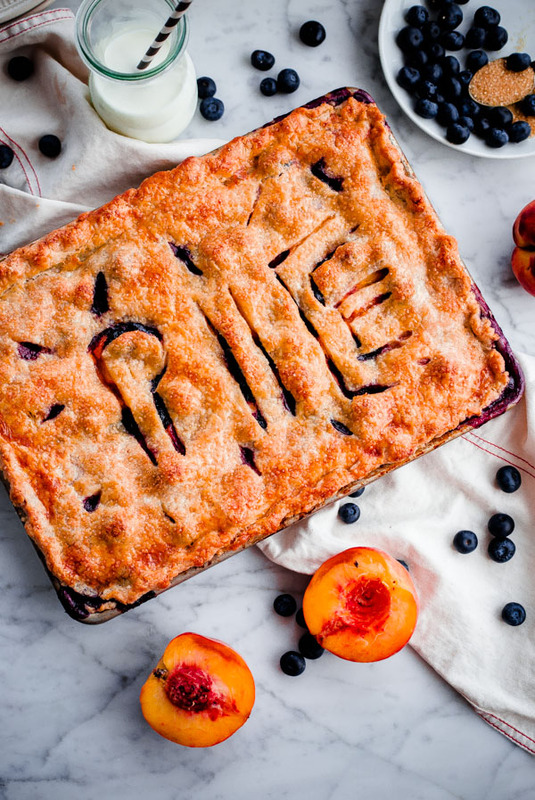 This flaky slab pie, packed with fresh blueberries and yellow peaches, is baked in a quarter-size baking sheet, making it easy to transport and slice, and perfect for pie crust lovers. Serve warm with vanilla ice cream all summer long! If I were to write my own lyrics to Sound of Music’s “My Favorite Things”, my version would be about pie. Pie, pasta, and parmigiano-reggiano cheese. These are a few of my favorite things. 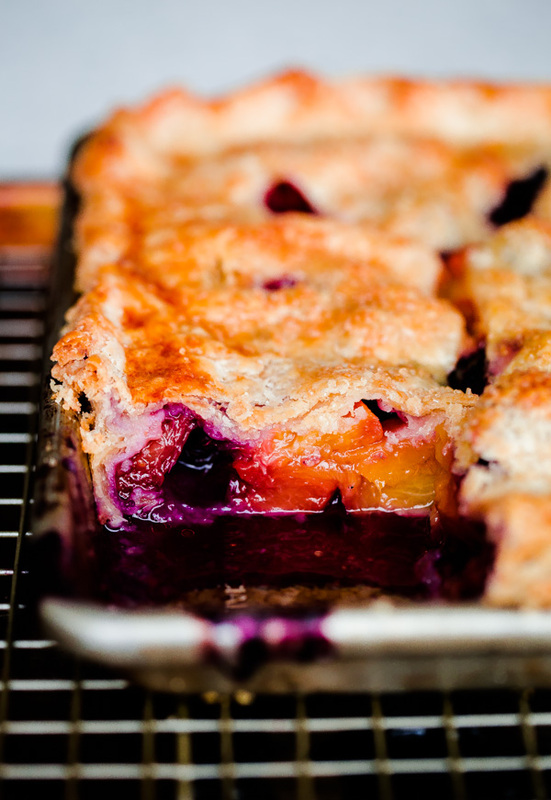 Let’s cozy up in that glorious blueberry peach filling and stay there forever. Ok? Does it get more dreamy than this? I don’t think so. If it were up to me (and not concerns over my ever expanding waist line), I would eat warm homemade pie with vanilla ice cream every night of the week. Who needs bikinis when you can eat pie. I mean, really. It’s no contest. Pie wins. Always. Peaches are at their absolutely prime right now! We’re eating them by the pound and pound each week. I’m lucky if I can get the last ripe peach in the fruit bowl before Connor snags it and I have to go back to the grocery store or farmer’s market to grab more. We eat ’em straight, grill them, put them on yogurt and ice cream, serve them with weekend waffles, add them to salads (make this one! ), and of course, we eat them in pie. Peaches and pie. Yes. If you haven’t made a peach pie yet this summer, get in the kitchen and make one as soon as possible. Put it on your weekend agenda. 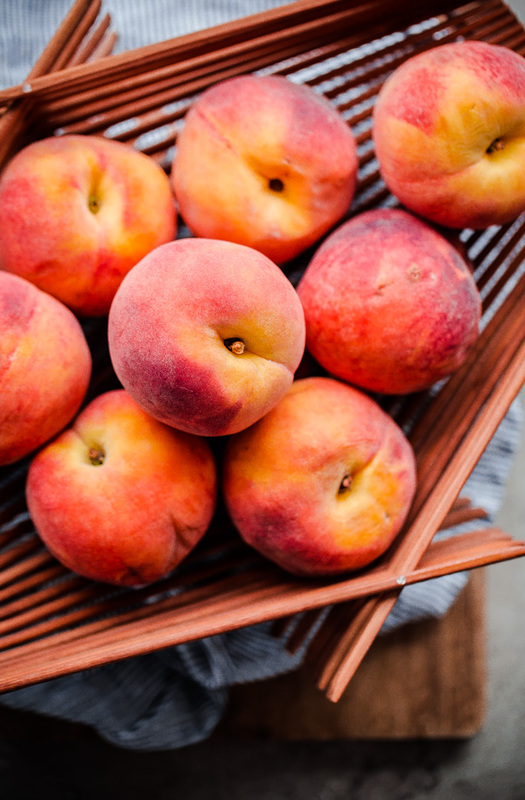 You have a few days left to allow the peaches the ripen on your kitchen counter top! Don’t be intimidated by the length of the recipe below! It looks extremely long (even to me, and I wrote it for god’s sake). I tried to be as detailed as possible in order to eliminate any anxiety or concerns that might occur during the pie-making process. Everything will work itself out. Traditional pies and slab pies are pretty much the exact same thing, but the vehicle for baking the pie is little bit different. Instead of using a traditional pie dish, you’ll be using a baking sheet! Hence, a slab of pie. Some people make slab pies in full-size baking sheets. As much as I would love to have an entire sheet pan worth of pie sitting in my kitchen, I only live with one other human being and have zero will power. I’m going to assume I’m not alone in this. 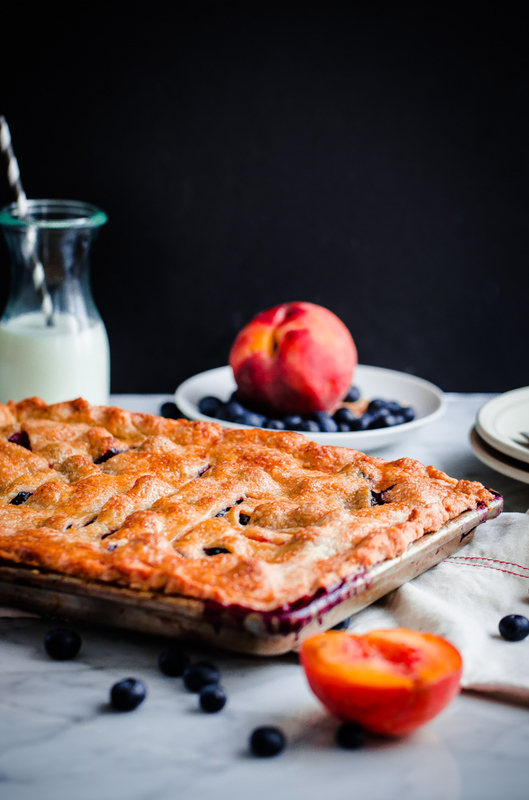 For that reason, today’s blueberry peach slab pie is made in a quarter sheet pan (9-inches x 13-inches)! It serves between 8 to 10 people depending, of course, on how much you love pie. The best part about slab pies? Other than the fact that they look cool and are a bit different? They are infinitely easier to slice and serve (and even transport) than traditional pies! Oh, and they offer a higher crust-to-pie-filling ratio. If you’re into that sort of thing, which I am. The biggest pain when it comes to making peach pie is, as you guessed, peeling the peaches. Trust me, I hate that part as much as everyone else. Most recipes call for blanching peaches briefly in boiling water, but I find that to be extremely cumbersome and it can be far too easy to over-blanch the peaches. My favorite method for peeling peaches quickly and easily is to lightly score the bottoms of the peaches with an “X”, place them in a very large bowl, and pour boiling water over them. Simply let the peaches hang out in the warm water for about 10 minutes, and the skin will start to gently peel away from the flesh. It’s my favorite trick and it keeps the peaches firm for slicing too! Whatever you do, make sure you have a nice tub of vanilla ice cream in your freezer whenever you make pie. The two must go hand in hand! Pie without ice cream is blasphemous. And don’t worry, writing on your pie is totally optional! Prepare Pie Dough: Place flour, sugar, and salt in the bowl of a large food processor. Cut the cold butter into 1/2-inch cubes and place in a separate small bowl. Chill the flour mixture and butter in the freezer for 5 to 10 minutes. Remove both the flour and butter from the freezer, and pulse the flour mixture in the food processor several times to mix thoroughly. Add the butter, and pulse several times until the butter is thoroughly incorporated and the butter is in small pieces—you want the butter pieces to be in varying sizes, some small and others slightly larger. This will result in the flakiest crust. While pulsing, slowly add the ice water and continue to pulse until the dough just begins to clump together loosely. Remove the dough to a clean counter top, shape together with your hands into two, equally sized square discs. Wrap each piece of dough tightly in plastic wrap, and allow to chill in fridge for a minimum of 1 hour. Preheat the oven to 425 degrees Fahrenheit. Lightly grease a quarter (9-inch x 13-inch) baking sheet with butter. Set aside. Prepare Pie Filling: Using a sharp pairing knife, lightly score an “X” into the bottom of each peach and place them in a very large, shallow mixing bowl. Place the peaches in a bowl and cover completely with boiling water (I used my electric kettle to do this, and needed to boil about 8-9 cups of water). Allow them the peaches to sit in the boiling water for 10 minutes or so (or until the peel is just beginning to pull away from the peach), then remove and place them on a clean kitchen towel until they are cool enough to handle with your hands. Peel the peaches, remove the pits, cut them in half, and cut each half into roughly eight equal-sized wedges. Place peach wedges in a large, clean mixing bowl. Add the blueberries, sugar, cornstarch, lemon juice, nutmeg, cinnamon, cardamom, and pinch of salt. Stir mixture together gently. Assemble Pie: Remove one disc of pie dough from the fridge (the larger one, if they are slightly different sizes), and allow it to rest at room temperature for 5 to 10 minutes. In small bowl, whisk together the egg and cream/milk and set aside. Once the dough has rested, place on a lightly floured counter top. Using a lightly floured rolling pin, roll the dough into roughly a large rectangle, roughly 11-inches wide and 15-inches long (don’t worry if the edges are not perfectly straight, try to work quickly to avoid overheating the dough). Use your rolling pin to carefully transfer the dough to the greased baking sheet. You want to drape the dough gently into the baking sheet, so that it fills out the edges and corners, but still overhangs the sides a bit–avoid stretching the dough, as this will cause the dough to shrink once baked! Place in the fridge to keep cool as you roll out the remaining piece of dough (roll out so that it is roughly just over 9-inches in width and 13-inches in length. 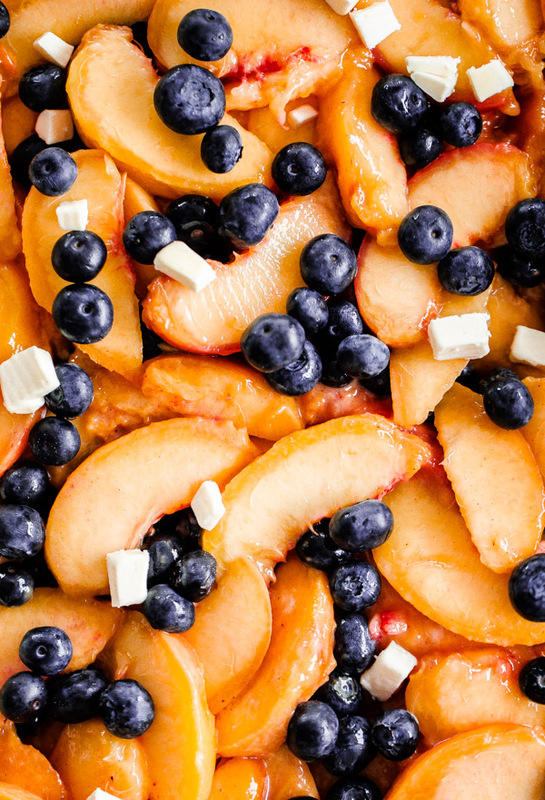 Remove the baking sheet from the fridge, add the peach and blueberry filling, and evenly spread it out in the baking sheet with a spoon or spatula. Gently distribute the remaining tablespoon of cold butter (cut into very small pieces) over the top of the fruit filling. Drape the top piece of dough over the filling, and fold the bottom dough overhang over the top dough, and crimp to seal. Brush the top and edges of the dough with egg wash. Sprinkle evenly with demerara or sugar. Use a sharp pairing knife and make several 1-inch long slits to allow the pie to vent in the oven. Reduce the oven temperature to 375 degrees Fahrenheit. 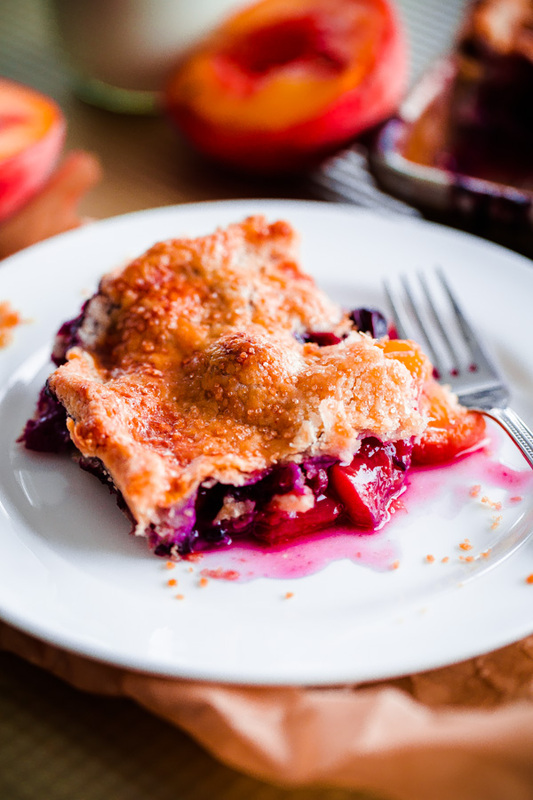 Place a large baking sheet (10-inch x 18-inch) on the bottom oven rack to catch any fruit or pie spillage. Place the pie on the center-rack and bake at 375 degrees (F) for 50 minutes to 1 hour, or until the dough is golden and the filling is lightly bubbling. Transfer to a wire rack until lukewarm or completely cool, minimum of 1 hour. The cooler the pie, the less the filling will run once sliced into! Serve with vanilla ice cream. 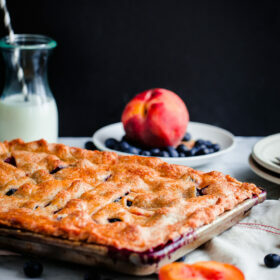 Fruit pies can be kept at room temperature (loosely covered) for up to two days, or in the refrigerator for up to a week.